Sherri Williams, assistant professor of race, media and communication. 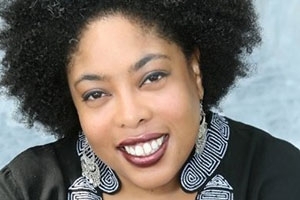 As diversity, inclusion and equity in media continue to be hot topics, an American University professor has partnered with one of the nation's most recognizable scholars for a new initiative aimed at training the next generation of black journalists. Sherri Williams, a professor of race, media and communication at the University's School of Communication, along with Wake Forest University professor and journalist Melissa Harris-Perry are co-founders and co-directors of "Black On Campus," a partnership with The Nation and TheNation.com. "Black On Campus" is a national program for emerging storytellers aged 19-25 enrolled full time in two or four-year colleges, universities, or graduate schools. Participants will work with Williams and Harris-Perry and will produce solo and joint pieces for publication by The Nation in 2018. Williams says the genesis for the program was the Elle Media Scholar program she also helped run with Harris-Perry. "We both wanted to continue that writing program," Williams said. "But I wanted our theme to be something that was more concrete and tangible. There have been so many important seismic shifts on college campuses that have affected black students, I wanted us to cover what it's like to be a black student on campus, right now in this particular social and political moment." In addition to covering issues of the day, students will receive training from the Ida B. Wells Society, an investigative journalism group started by black journalists who work at some of the top media outlets in the country, including the New York Times, ProPublica and the New York Times Magazine. "I hope that these ten students can tell stories about their peers that the rest of the country either doesn't know about or has not necessarily paid a lot of attention to in the past," Williams added. "I'm hoping that this project will bring a lot of awareness and maybe even change some policies, practices and programing to fit the needs of black college students across the country. Our goal is to affect America at large." Lauren Lumpkin, a senior in American University's School of Communication, is one of the ten participants.